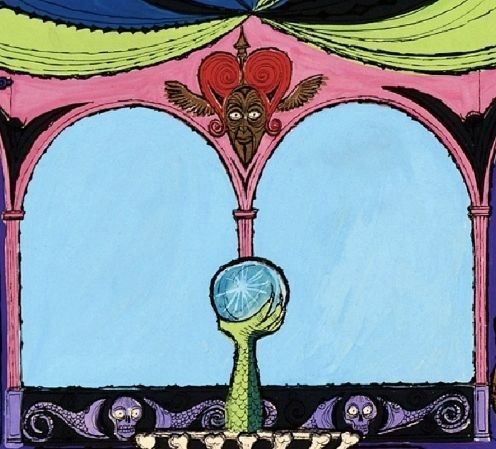 If not for the massive interruption caused by the 1964 New York World's Fair projects, the Haunted Mansion could have been completed and opened before the end of 1963, and if it had, it would have followed a template designed by Rolly Crump and Yale Gracey and would have been a very different kind of attraction. 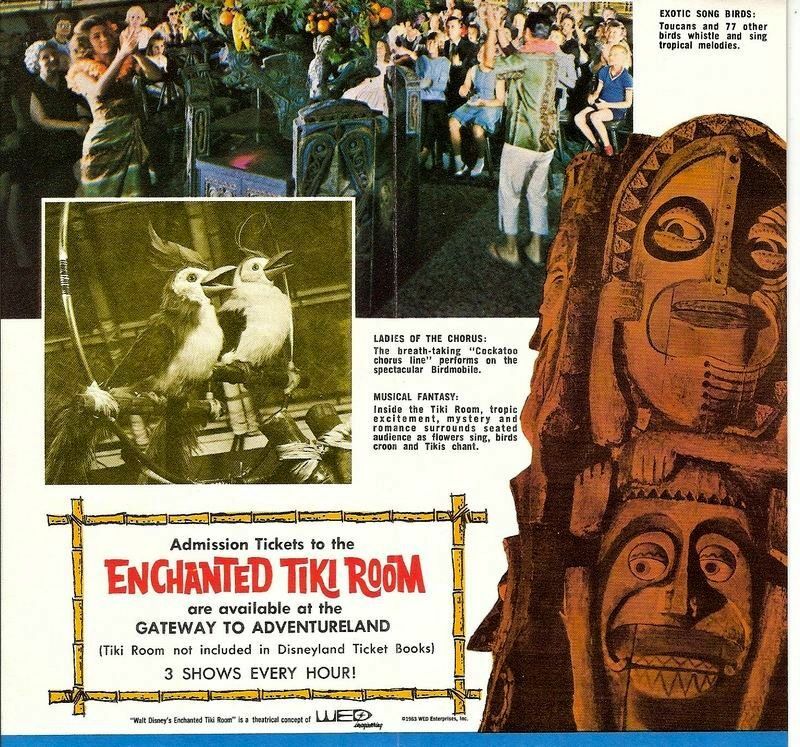 In an earlier post I suggested that if you want to see how that version of the Haunted Mansion would have functioned, check out the Enchanted Tiki Room, which opened in 1963. The Haunted Mansion was going to be a walk-thru with maybe six or seven rooms and a two or three minute presentation in each one before you moved on to the next. It would have been not unlike a series of short Tiki Room shows. We know that Rolly was enamored with the idea of a weird, surreal house that was itself alive, like the bewitched castle in "Beauty and the Beast" as the tale is told in Jean Cocteau's La Belle et la Bête (1946). 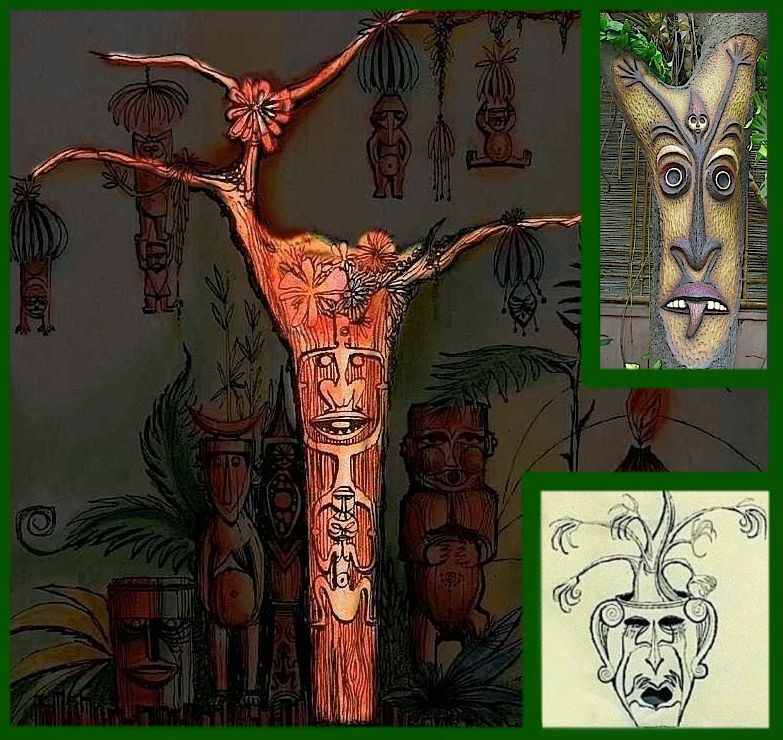 I pointed out in that earlier post that if you simply exchange "tiki god magic" for "ghosts," the Tiki Room (minus the birds) is pretty close in concept to the sort of thing Rolly had in mind for the Mansion. And remember, too, that Rolly did a lot of work on the Tiki Room. This post is simply going to explore the parallels in a little more detail. 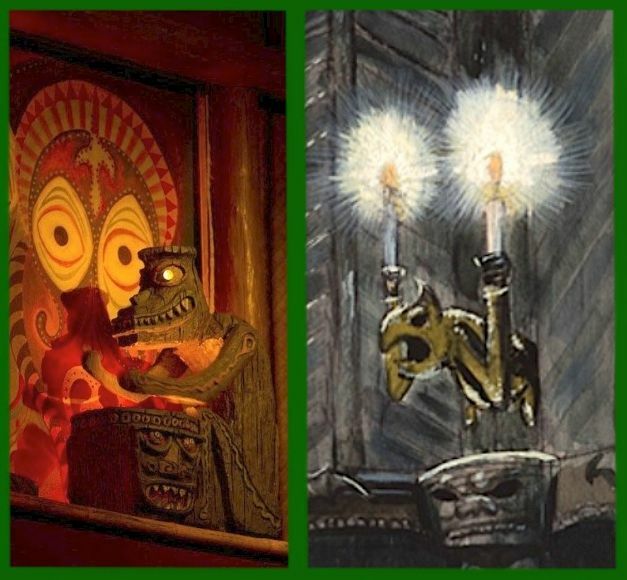 One reason why the thought experiment of substituting "tiki god magic" for "ghosts" feels so easy and sounds so right is that the Imagineers already did it for us. 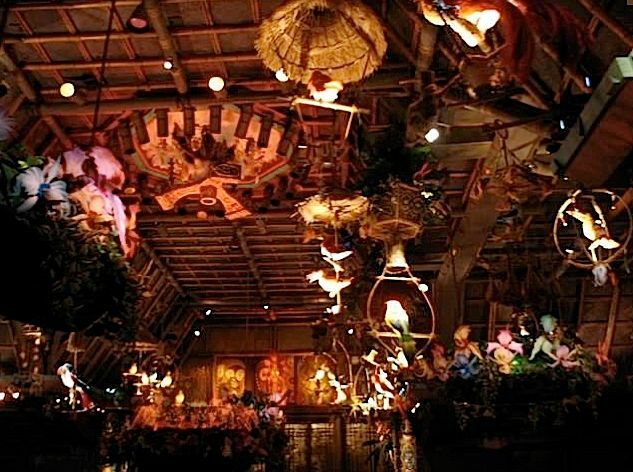 An important transitional segment in the Tiki Room show is derived not from Hawaiian luaus or Don Ho floor shows but from the haunted house tradition. At one point the room is suddenly plunged into darkness as thunder rolls and lightning flashes in the windows, accompanied by heavy rain. In case you don't get the message, the birds tell you that the "gods have been angered." It only lasts a few seconds, but it's definitely supposed to give you a little jolt. Faux thunderstorms outside the windows were a prominent element in Ken Anderson's 1957-58 plans for the DL Ghost House, but there is no need to appeal to that in order to explain what we see in this part of the Tiki Room show. When it comes to haunted houses, stormy windows are even more of a hoary old cliché than "hoary old cliché." All I'm saying here is that the Tiki Room itself makes the point that there isn't a whole lot of difference between an enchanted building and a haunted house. 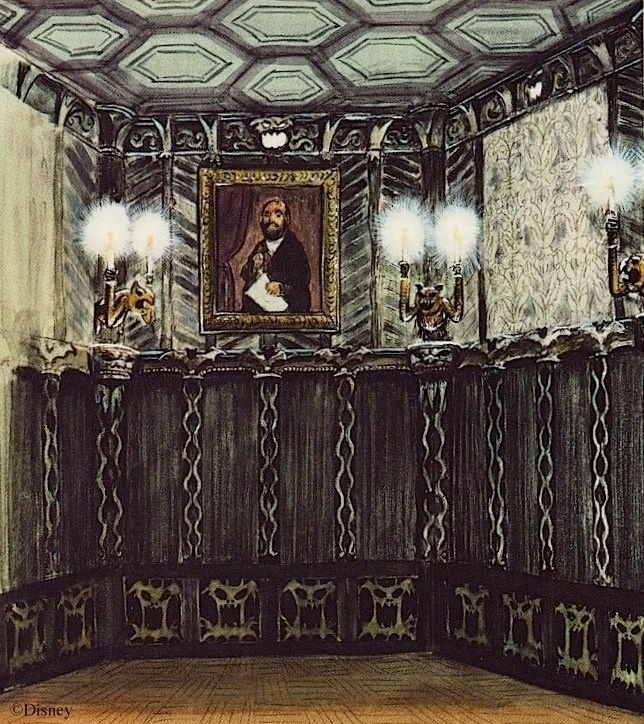 In discussing La Belle et la Bête, Rolly frequently refers to the living faces carved into the fireplace hearth in the Beast's castle. 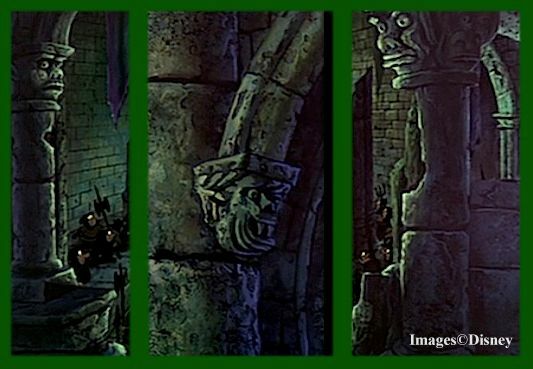 Incidentally, Rolly wasn't the only one at Disney who liked the idea of a creepy carved face in a capital or corbel reacting to the immediate environment like a living person. You'll find this happening in Sleeping Beauty (1959), although it's easy to miss. 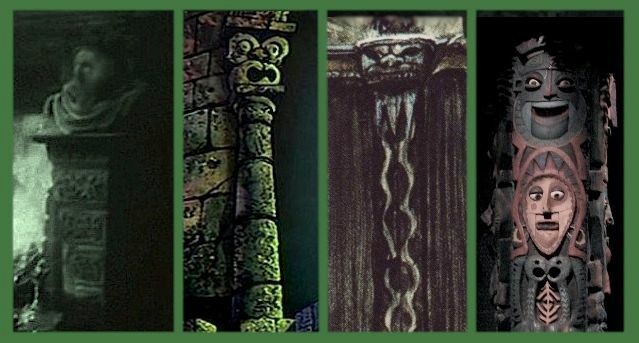 It's not merely the fact that Maleficent's castle is a rather gargoylish affair, with lots of humanoid corbels and capitals. That by itself is no big deal. of the scene to shocked and frightened after Mal's goons fail to prevent the escape and her pet is petrified. And now you know where I got the faces I used in the last post. but those are mere and trivial discrepancies, whereas the changed facial expressions fit the story and are undoubtedly deliberate. But back to topic. What about the Haunted Mansion? Well, the gag is there, isn't it? 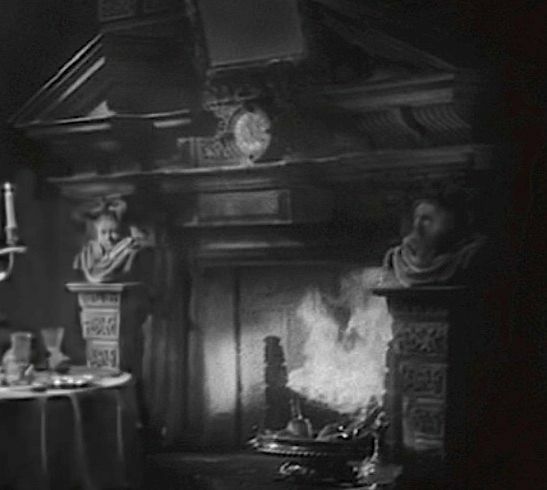 Rolly likes to talk about how the Cocteau busts blow smoke out of their noses and mouths, and they do that once or twice, but for the most part all they do is (1) turn their heads to watch Belle or her father as they walk by, and (2) change their expressions. The "follow-you" busts do the first and the singing busts do the second. Both of these effects are Yale inventions and would certainly have been used in the Crump-Gracey HM. Is there anything to indicate how the Imagineers might have employed this gag further? Perhaps. 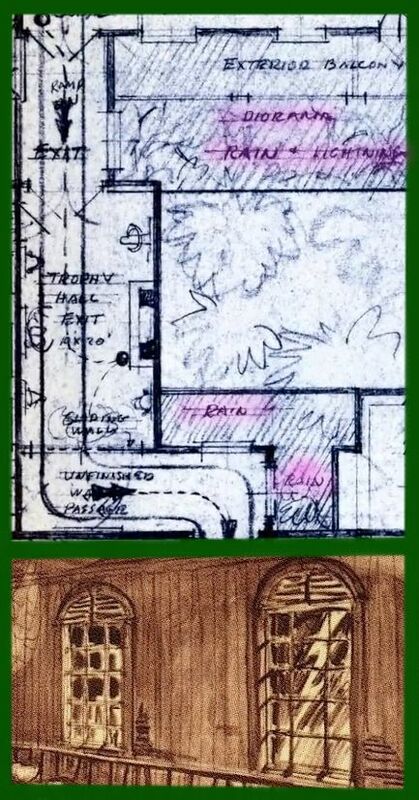 Some concept art seems to reflect the wilder, weirder Mansion that Rolly and Yale had in mind, and in one sketch you see faces that may well have been planned as animatronic, presumably doing the sorts of things you see in the two Beauties (i.e. and the Beast and Sleeping). We've looked at this stretching gallery artwork several times before . . .
(or "Tropical Serenade," as they called it in Orlando until 1997). 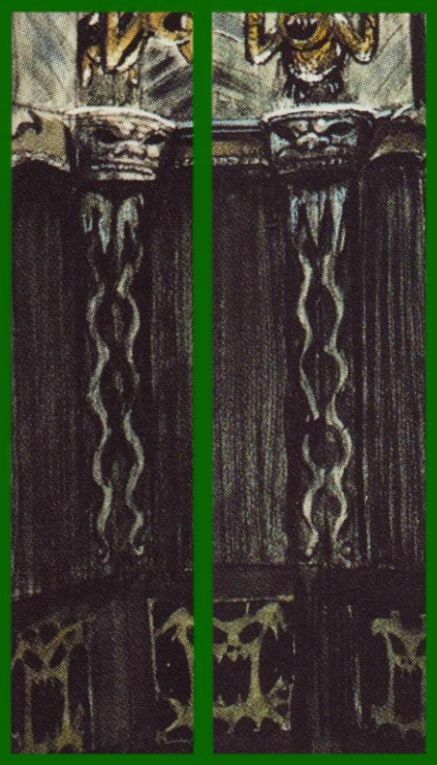 Those faces in the corbels/capitals of the stretching room sketch look kind of like squashed tikis to me. That's a bit of a stretch, I admit. 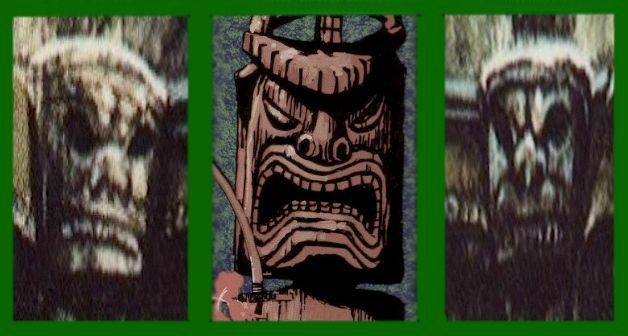 If you think about it, most tikis are a little sinister in appearance, not to mention surreal, or even downright scary, so it shouldn't surprise us that you can find common ground between them and the Haunted Mansion. 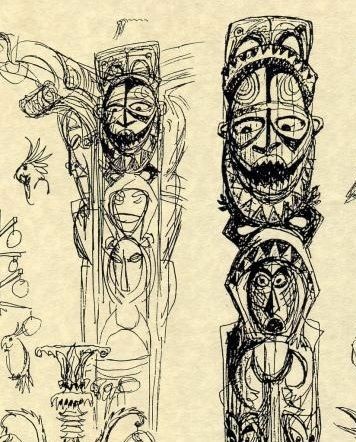 How much conceptual daylight is there, really, between, say, Rolly's concept art for Tangaroa and certain specimens from the Museum of the Weird? 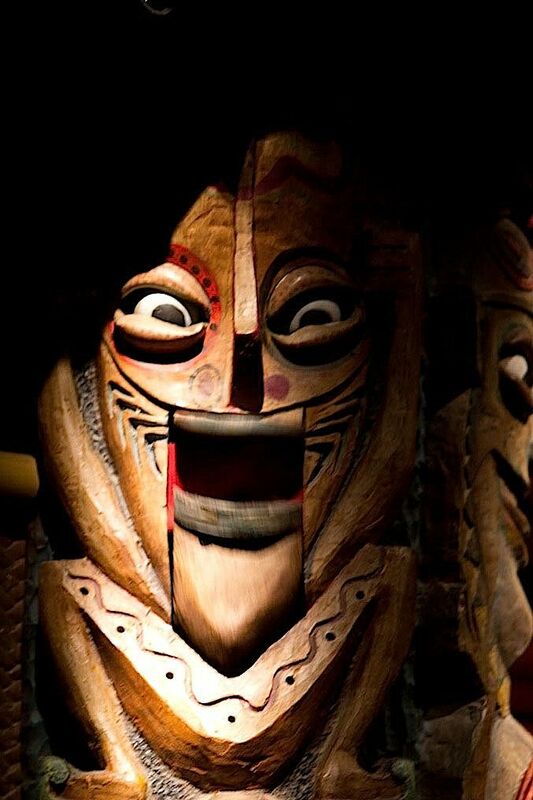 Remember, kids, "tiki" rhymes with "freaky." And off we go. 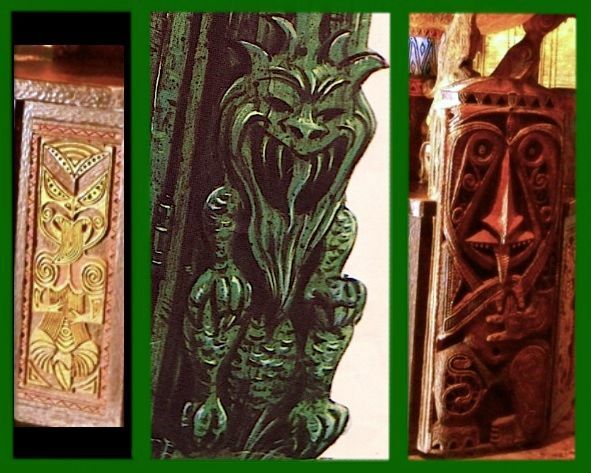 Once you start looking for visual echoes between Mansion art and the Tiki Room, you find them. How many of them are "really there" and how many are just your imagination is another matter. Since we're dealing with people who relied on their artistic instincts and worked on multiple projects at the same time, one hesitates to dismiss such echoes as entirely coincidental, but if you insist on something more solid than that, once again I'm going to beg off, like I did with the Sleeping Beauty backgrounds. We wander among shadows, children. Remember our discussion of the possible cross-pollination between the boat ride version of the HM and the POTC in the previous post? Yeah, well, it's like that. 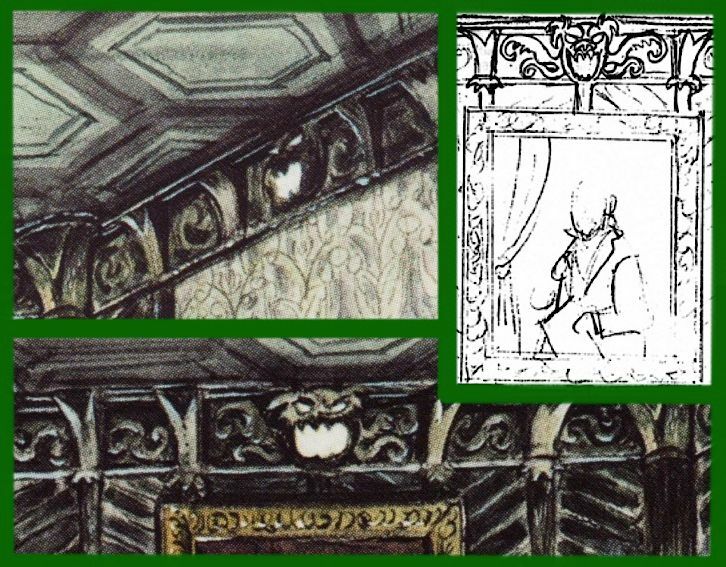 In that gallery sketch, there are sinister faces in the center and at the top of each wall. 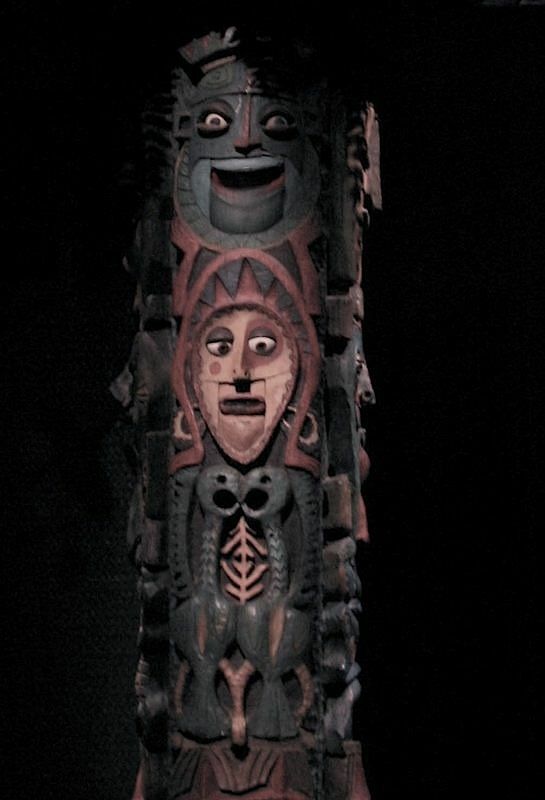 It's vague, I know, but just by virtue of the location, I'm reminded of the drumming tikis. A little. those. Here at last are moving faces carved into a wall. like La Bête and Sleeping Beauty and the figures in the stretching gallery concept art. 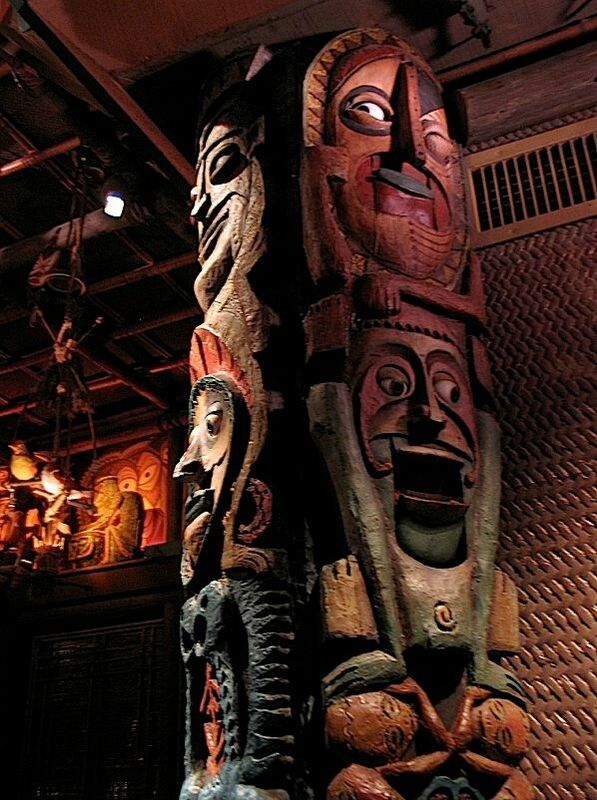 The chanting totem poles have always been my favorite things in the Tiki Room, and they're even more fun when we recognize that they are about as close as we'll ever get to something we probably would have seen in a Haunted Mansion that never was, if you follow me. 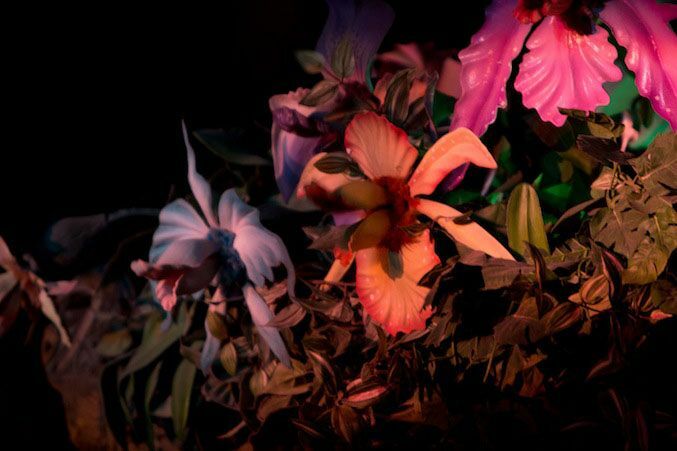 Another point of contact between the Tiki Room and the Mansion is botanical. Rolly loved him some man-eating plants. 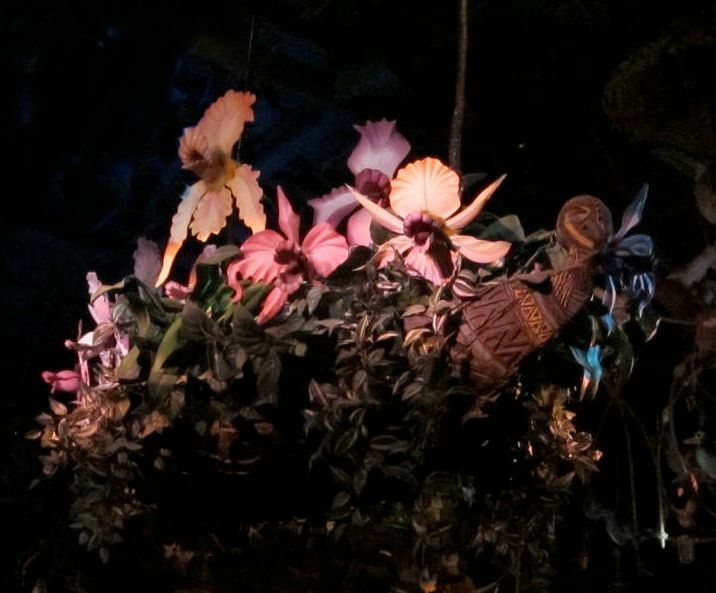 It's pretty easy to visualize how this thing would or could have worked by looking at the singing flowers in the Tiki Room. Sure, they sing prettily, but I've always thought they were kind of creepy. No eyes. 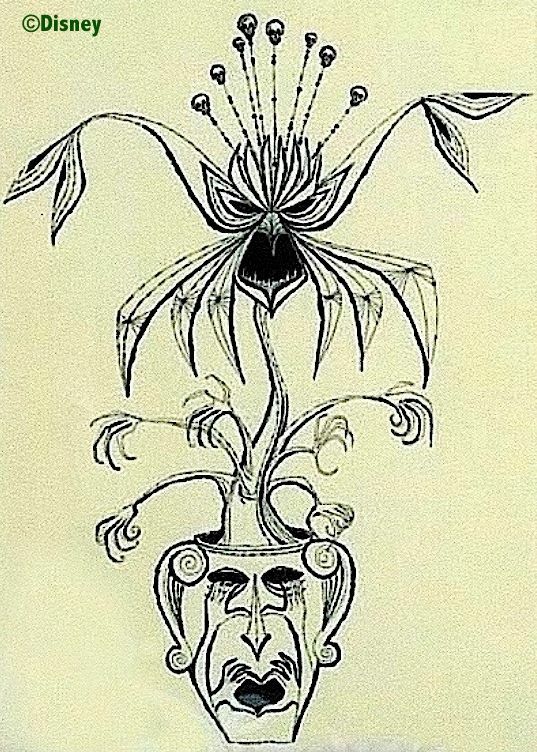 At least the singing flowers in Alice in Wonderland had eyes. 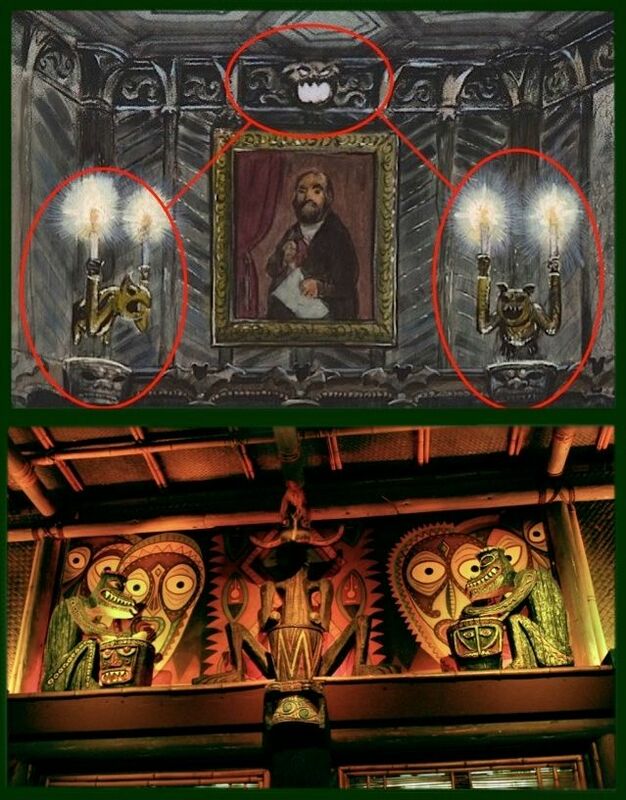 Someone is bound to point out the similarity between José in the Tiki Room and the Raven in the Mansion, who like he was going to be your emcee at one point. But I'm not sure a raven was ever part of the Crump-Gracey version of the HM. True, a raven figure had already been introduced previously in Ken Anderson's artwork, but the bird seems out of place in the surreal version between Anderson and Atencio, and I'm not aware of any plans to use him. Can you really imagine a normal-looking raven in the Museum of the Weird? 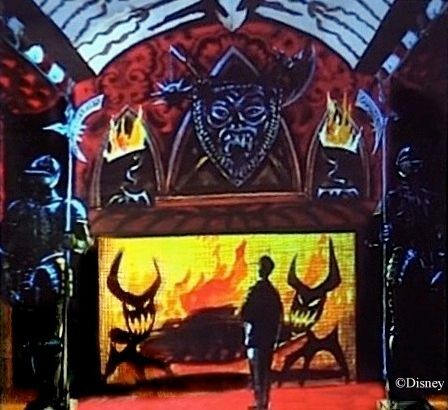 or in those flaming red "Great Hall" paintings by Marc Davis? Now if you give the raven seven eyes, a pig nose, and trade in one wing for some tentacles, then maybe we can talk. 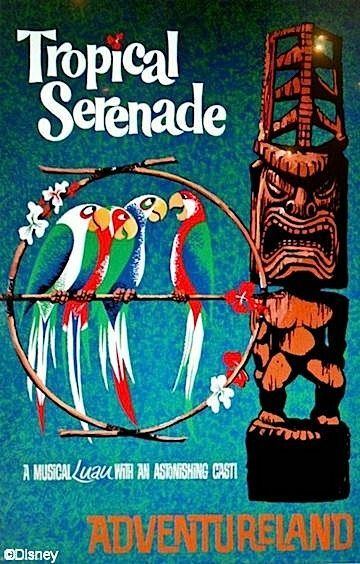 Of course, we can credit the Tiki Room for showing us that audio-animatronic birds work pretty well. At least mechanically, the Mansion's raven is but a footnote to the earlier attraction. Until next time, Aloha, Foolish Mortals. Okay, I'll just say this. The last post was wildly popular (by LF standards), and it brought in a lot of new traffic. I suspect that some of you think this current post is a little lame by comparison. Hey, they can't all be the Mona Lisa. Anyway, rest assured that the next post is pretty gosh-darn cool, if I do say so myself, featuring some things that have been there all along and yet no one has ever noticed. And I promise I won't make you wait two months for it.